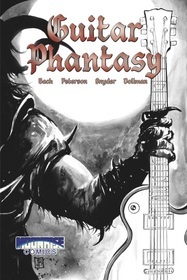 GUITAR PHANTASY is a classic (rock) story: boy meets guitar; boy fights demons. Buy your digital copy from ComiXology or DriveThruComics. Purchase your print copy here from Indy Planet. This vibrant fantasy from Timothy Bach (Gargoyle By Moonlight) and Carl Peterson (MAD Magazine) is a rock'n'roll fairy tale mashup of Scott Pilgrim and Lord of the Rings. Guided by the odd little shopkeeper of a second-hand music store, Kev discovers an incredible guitar and uncovers the power of music and the untapped force inside of himself. But when the devourer of all things, a wicked-looking, music-hating demon appears, can Kev play fast enough, hard enough to defeat the demon? With colors by Robt Snyder, letters by E.T. Dollman, and a cover from Silvio dB. Buy Guitar Phantasy now! Download it from ComiXology or DriveThruComics, or buy a hard copy from Indy Planet.